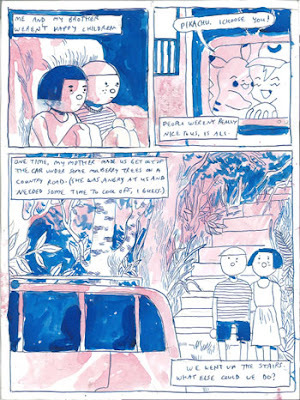 The 42nd issue of the venerable mini-Kuš! series, Alien Beings tells the tale of young girl who, with her family on a drive one night, encounters possible UFOs hovering above them for a brief period. 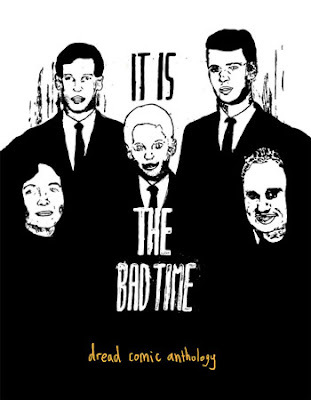 "After that,” the girl tells us, "is when things started to get weird at home." As her parent's relationship becomes ever more fractured by arguments and they move towards divorce, she grows confused about the boy she's supposed to like at school and her best friend Aleksandra, for whom she clearly has deeper feelings. Through it all the lyrics of pop music on the radio describe love and romance in a way that doesn't jibe with the marriage of her parents or her own experiences. 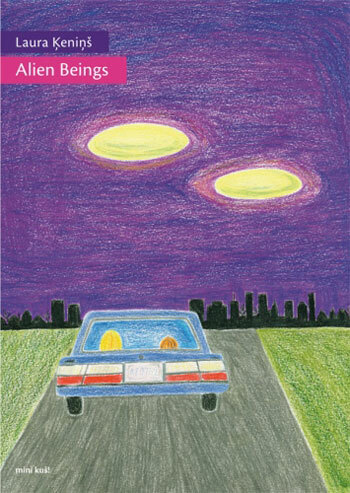 Though at heart a coming of age tale of a typically confused adolescent, Alien Beings is also about the attempts we make at controlling or at least making sense of the chaos of human relationships, and the malleable nature of perception. Laura Ķeniņš, an artist stationed in Halifax, Canada, successfully juxtaposes the wan nature of her narrative by rendering it in soft pastel colors, and her slightly naïve style fits the young narrator's voice perfectly. It's a compact, insightful comic. Hands in the Leaves is a mini-meditation on gardening. In it, a woman delights in her beautiful garden, but is disturbed by the hands and faces she sees in the various flora. Is she crazy or is this really happening? And if it's real, do the plants want to hurt her? Sophia FB's presentation is free-flowing, with the black and white line drawings of the woman surrounded by pleasingly expressionistic splashes of color for the plants. It's almost like a little art study, with effective touches of the macabre. 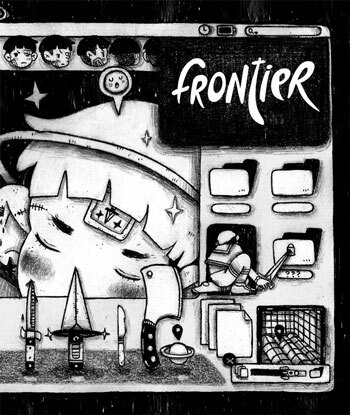 Space Can Be Scary but Sometimes we Need It is a B&W comic about a young girl who journeys to a remote area of Texas for the imminent landing of a UFO. "I don't belong here," She tells her mother, "on earth." It's a good little comic that might have benefitted from being longer; it has an effective quality of yearning and mystery, summed up by the epigraph on the back cover: "The odds of two universes coinciding are small. The lure, however, is immense. We send starships. We fall in love." Of all her comics I was most struck by the emotionally direct Iced Tea, a short memoir about an incident of childhood emotional abuse. Sophia relates the time she and her brother were deliberately dropped off on the side of a country road by their mother for unspecified reasons: "She was angry at us and needed some time to cool off, I guess." The bewildered pair, wondering if she will return, wander off into some sort of woodsy artist commune, where a simple act of kindness—something the children are clearly unused to—triggers a deep emotional reaction. Readers may find this story triggering memories of their own childhood sorrows—I've rarely seen such an honest depiction of vulnerability. The piece is made all the more moving by its straightforward presentation. I look forward to seeing what Sophia FB will be doing in the future—she is a talent to watch. This interesting anthology, from a number of talented young students at Center for Cartoon Studies (CCS), is built around stories of dread, in many of its manifestations, be it personal insecurities, body horror, or other fears personal to the storytellers. As editor Lee writes in his introduction: "every artist involved should write a comic that would contain at least one panel that was frightening or traumatic to draw." Of all the stories I especially liked Emily Parrish’s “Monstrum,” which taps into fears of excessive (perhaps unholy) gastronomical appetites; Anna Selheim's "Wasted," which is grounded in obsessive fears of wasted potential (a refreshingly real, relatable subject of dread to focus upon), and Iskander’s "Ugly Boy," which smoothly (and wrenchingly) includes themes of bullying, deformity, and bad parenting. Iskander's is also the most technically accomplished art in the book. "Spores," by Angela Boyle, is another winner, a downbeat tale of an innocent young woman who falls victim to a monstrous entity disguised as an old woman from whom she rents an apartment. It's a creepy conclusion to a successful, well-rounded collection. This issue of Youth in Decline's acclaimed monograph series features Kelly Kwang, an artist previously unknown to me but about whom I suspect I'll be hearing much more in the future. This book is less a narrative than an introduction to its creator's fabulist, video game-inspired universe. Kwang's Space Youth Cadets are a crew of groovy cybernaut fashionistas. Kwang delineates their milieu and their individual "looks" with a mix of gorgeous black and white pencil drawings, comics, murals, and even some photos. Though the Cadet's realm is distinctly cyber-esque, it feels swoony and romantic rather than cold and digital; never more so than in the drawings of one character encasing themselves in "internet jelly." Kwang's overall aesthetic is fresh, original, and super-fun. The mini-genre of comics about teaching has been growing in recent years; artists such as Cara Bean, Robyn Jordan, and Aron Nels Steinke have all mined this rich field for personal storytelling, humor, and advocacy. Chicago-based artist Alex Nall began drawing his own comics in this vein in 2013. 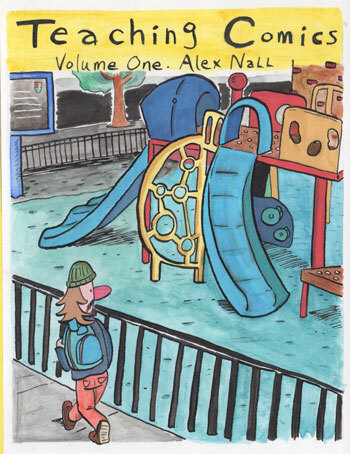 Presented in diary format and rendered in his Brunetti-influenced drawing style, Nall describes the occasional triumphs and many travails of teaching art to inner city children, which naturally provides Nall with insights into own artistic drives, ambitions, and insecurities. He also gives us an acute sense of the day-to-day problems of being an instructor, as when he tries to help an uncomprehending student solve a very basic arithmetic equation, or his continuous frustrated efforts at controlling his more unruly charges. When he discusses the latter issue with the Principal, Nall is told: "I experienced the same thing as a first year teacher and my advice to you is to push through it and work with your teacher to create the most stable class you can"—which sounds realistic if not exactly inspiring. Nall is obviously a sensitive arteest but he has a wry sense of humor, which gets him through some of the rougher times. The stories collected here are honest, sad, hopeful, and compelling—and a sobering glimpse into the state of our public education system. 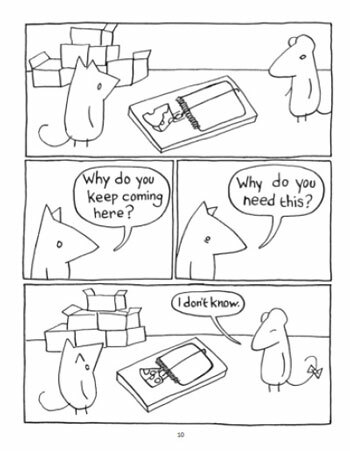 Marian Runk has made a welcome return to comics after a year or so of relative inactivity. 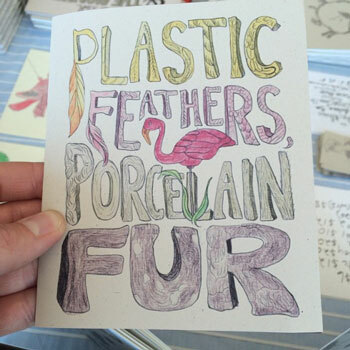 Plastic Feathers, self-published in 2015, is a clever series of full color drawings of lawn ornaments that adorn various yards and gardens in Runk's Chicago neighborhood, including flamingos and other birds, squirrels, deer, and humanoid figures. Runk captures each in all their kitschy charm, with a gently humorous poignancy in the final figures. Get a copy for your favorite gardener. Sometimes I Pay Attention is more of a collection of odds and ends (the title page indicates the material spans from 1999-2016), though it all coalesces nicely. Included are drawings and short comics relating to Runk's birdwatching activities, odd dream imagery, found graffiti, and a few short poems and song lyrics (Runk is also a musician). As the title suggests, the focus is on the seemingly peripheral things in life—in books like this and Plastic Feathers, Runk drives home the fact that Paying Attention is its own reward. As always, her work is characterized by an unpretentious, homespun charm, and these beautifully handmade chapbooks fit her aesthetic to a tee. This mini has notably fine production values: it comes complete with endpapers and a coolly elegant cover design—the meaning of which becomes apparent after reading the story within. Silver Wire is a dark, ruefully funny satire of miscommunication and ineffable longing in primary relationships—enacted here by male-female pair of mice. Shiveley's line art has a simple, almost artless grace, and he has a great sense of pacing. His deadpan humor is in particularly high form in the back index, which includes entries such as "Callous Disregard," "Helpless flailing," and "Inexorable march of time." All of that is instantly relatable, which is what makes the story so acutely funny. One of my favorite minis of the year, this is also the first release I've seen from both Shiveley and Uncivilized Lab (an imprint of Uncivilized Books) and I really look forward to seeing more from both. 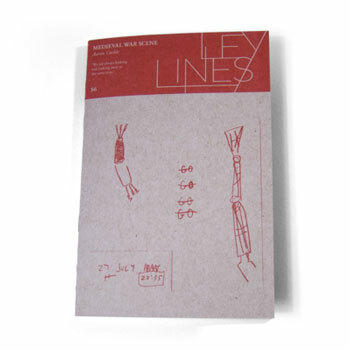 From the back cover: "Ley Lines is a quarterly publication dedicated to exploring the intersection of comics and the various fields of art & culture that inspire us." Thus far I've seen two issues of this series, which is a co-production between Kevin Czapiewski's Czap Books and L. Nichol's Grindstone. "Medieval War Scene," by Aaron Cockle, takes as its starting point the work of several artists, including lesser knowns W.G. Sebald, Werner Heldt and Anne Carson, along with Sappho and Edgar Degas. Cockle has always been an interesting but challenging artist, with a particular interest in the various physical forms and codes of language. Here he combines passages from the above artists with repeated visual motifs of vases and abstract shapes to form a mesmerizing tone poem of decay, destruction and regeneration, reverberating through history. A quote from Anne Carson on the inside front cover is key to my interpretation: “Even though you are approaching Sappho in translation, that is no reason you should miss the drama of trying to read a papyrus torn in half or riddled with holes or smaller than a postage stamp—brackets imply a free space of liminal adventure.” This is a beautiful, haunting little book, deserving of careful reading(s), and my favorite work of Cockle’s to date. "Made with Love in Hell," by Providence, RI-based artist Mimi Chrzanowski, is a loopy riff on Hieronymus Bosch's infamous triptych The Garden of Earthly Delights, specifically the third panel: Bosch's depiction of hell. In Chrzanowski's hands, it's Mother's Day in the underworld, and there's all kinds of merriment amongst its denizens. The loose plot involves demon sisters Minty and Bobby Dahl paying their mother a visit—who proves that moms will be moms, even in hell: "I'm just worried about you," She tells Minty. "I want you to be able to find the right devil man to support you financially." When she gets too mom-like and clingy, Minty reminds herself, "Just keep thinking about armored pups." Chrzanowski's Garden features many of the sights in Bosch's original, but with all kinds of goofball touches. Her line is thin and textured, and appealingly cartoony. It's all very imaginative and playfully funny—and nice to see Ley Lines open to featuring lighthearted work along with that of a more "fine art" focus.